America remembers many great battles that represent a turning point in a conflict that helped shaped our history. We think of D-Day in World War II that turned the tide of victory toward the allies despite horrific losses. But it is a unique battle that is remembered with pride and patriotism but is also a battle that was lost and almost everybody on our side brutally killed. But that was the case in the battle for the Alamo in 1863. 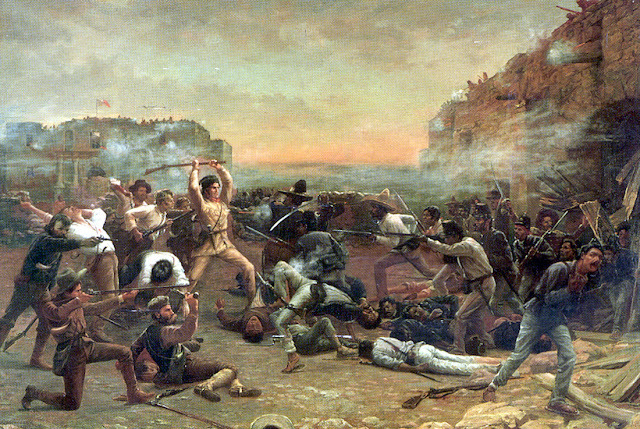 The battle for the Alamo was not a conventional battle in the sense of two equally matched armies fighting back and forth to retain the property. It was, to put it bluntly, a slaughter. But the brave stand of those few hundred Texans against thousands of Mexican soldiers continues to inspire us today because it was a stand against impossible odds but it was a stand that reflected the American ethic of never giving up or surrendering when there is a principle to be defended. The siege at the Alamo actually lasted thirteen days. It began on February 23, 1863, and it was over by March 6th. It is hard to imagine today, with Mexico to our south a trusted ally of the United States but this was a battle to stop that attempts by Mexico to invade the newly forming country of the United States which was an act of war to be sure. The brave men who stood against that vast army have become American icons of bravery and the American spirit and the names listed among those killed in that fort included Davy Crocket, Jim Bowie, the commander of the unit Lieutenant Colonel William B. Travis. It was Travis that inspired his men to fight against insurmountable odds and his courage is what we celebrate whenever we say that famous rallying cry that comes out of this battle which was “Remember the Alamo.” Travis wrote in a letter how he defied the Mexican attackers on the eve of the final siege. I am besieged, by a thousand or more of the Mexicans under Santa Anna. I have sustained a continual Bombardment and cannonade for 24 hours and have not lost a man. The enemy has demanded a surrender at discretion, otherwise, the garrison is to be put to the sword, if the fort is taken. I have answered the demand with a cannon shot, and our flag still waves proudly from the walls. I shall never surrender or retreat. I am determined to sustain myself as long as possible and die like a soldier who never forgets what is due to his own honor & that of his country. Victory or Death. It was this brave stand that actually turned the war against this invading army to the advantage of the Americans. The outrage from the slaughter of these men inspired that famous rallying cry that we remember even now centuries later when we hear those words “Remember the Alamo”. Their stand against Santa Anna gave Sam Houston the time to organize a much more potent army which went on to deliver to Santa Anna a stunning defeat at San Jacinto which was the turning point for Texas which went on from there to victory in this war. The spirit of Texas was never the same and to this day, Texas prides itself as a people of particular courage, boldness, and a unique independence that even sets them apart from the already fiercely independent American spirit. Moreover, the entire nation looks to this battle as an example of how a few good men helped deliver a victory, even if it was at the cost of their own lives. That indeed is the true spirit of patriotism.